The year is coming to a close, and we're about to enjoy a quick holiday break. 2016 has been a phenomenal (and in some regards turbulent) year here at Bohemia Interactive. Arma 3 was reinforced by several major platform updates, leading to its pinnacle moment in development: the release of the Arma 3 Apex expansion. On top of that, we've deployed Arma Mobile Ops for Android and iOS, which lets you build a military base and fight for dominance with other players whether you're outside or at home. DayZ has also made considerable progress this year and is on its way to Beta. There have been some key advancements in its underlying technology, which will open the door to new features and content, and an even more enjoyable and rich gameplay experience. Have fun with some of the improvements by playing this week's released 0.61 version, and help us bring the spirit of Christmas to Chernarus! Our other Steam Early Access game, Take On Mars, is getting very close to reaching its "Gold" milestone. What started as a game about Rovers and Landers, now captures the exploration of the Red Planet in its entirety. Become the Martian in the newly added story campaign, and lead humanity's most exciting undertaking firsthand. The Release Candidate (RC) Update for Take On Mars is now live on Steam. In November this year, we also introduced "Bohemia Incubator". This new label aims to unite our experimental projects, and share them with our players. By doing so, we can work together to shape the future of our fast-growing company. The first two Incubator games are Ylands and Project Argo. Learn more at http://incubator.bistudio.com, where you can also find more info on how to play the Ylands free trial and/or the free Project Argo Open Prototype. But what perhaps stood out most this year was seeing how you as players and fans continue to embrace our games - by playing, streaming and watching, modding, producing content, forming community groups, reporting issues, providing feedback, and much much more. All with a passion that we can only be grateful for. Even though we face many challenges, often have to be patient, sometimes make mistakes, the question whether it's worth it can only be answered one way: absolutely yes! Together with your support, 2017 is promising to become an incredible year. We can't wait to pop some bottles, celebrate, and get started again. 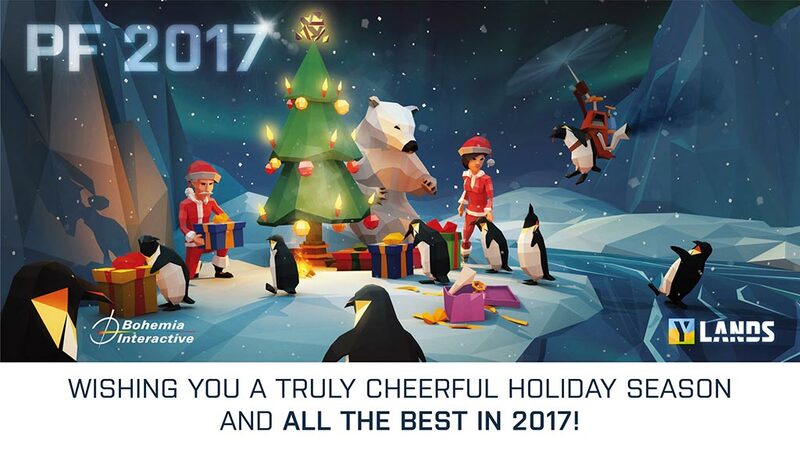 Thank you, and on behalf of everyone here at Bohemia Interactive: merry Christmas and a wonderful 2017!